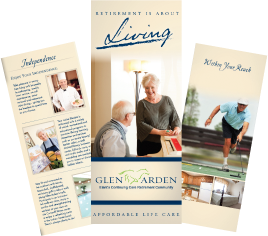 Here at Glen Arden, we understand the need for a vibrant and independent lifestyle, while having the peace of mind of available long-term care. This blog series highlights solutions and suggestions that others have found helpful and we are happy to share them with you. According to the Central Intelligence Agency’s (CIA’s) World Factbook, which tracks life expectancy at birth for every country in the world, revealed a surprising truth: In 2016, with a life expectancy of 79.8 years, the United States was only ranked 42 out of 224 countries. I don’t know about you, but I would have thought we’d be higher on the list! In fact, number one on the list, Monaco, has a life expectancy nearly 10 years longer than people in the U.S. Here in the United States, it is often thought that senior living communities play a role in length of lifetime. Specifically, many continuing care retirement communities (CCRCs, also known as a life plan communities) tout that their residents enjoy both longer and healthier lives than their peers who lives elsewhere due to various social and wellness benefits. There are a lot of great reasons that CCRCs strive to keep their residents as active and healthy as possible. Hopefully the main reason is because the community truly cares about their residents and wants to see them thrive. But another reason is more pragmatic: the bottom line. CCRCs are businesses, after all, and even not-for-profit communities need to stay financially solvent in order to to offer the services they are contractually obligated to provide to their residents. It should be no surprise that healthier residents cost less for the CCRC to care for, so the longer a community can keep someone fit, well, and injury-free, the more “cost-effective” that resident becomes. This is particularly true for CCRC providers who offer lifecare contracts. So, what sorts of things do CCRCs do to help ensure their residents are active and in good health? Here are just four of the top ways in which CCRCs encourage senior wellness. Staying physically active has countless health benefits for seniors, aiding everything from cardiovascular health to mental health. A large portion of CCRCs have an on-site fitness center, which will typically include a pool. This facility makes staying active convenient, and even fun, offering programs like low-impact dance classes, yoga, or aqua aerobics. Most of these fitness centers also will have at least one qualified fitness professional who is on-staff to help facilitate classes and teach seniors how to exercise safely. An increasing number of communities are encouraging outside activity with more walking paths, nature trails, and even adult playgrounds! The so-called “whole person” concept, which includes emotional, spiritual, educational, and social experiences, is growing in popularity in the CCRC industry. And communities are doing a variety of things to nurture residents’ “whole person.” From common areas for socialization, celebrations, and activities, to auditoriums for educational speakers and cultural performers, on-site amenities allow residents to continue to take part in new experiences and also enjoy one another’s company. Additionally, volunteer programs and university partnerships are more and more common within CCRCs, a great way to keep seniors active, mentally stimulated, and socially engaged. In general, all CCRCs will have at least some healthcare services available to residents on the community’s campus–a so-called “continuum of care” that ranges from assisted living to skilled nursing care and/or memory care. Convenient access to preventive care services and healthcare providers available to help monitor and treat chronic conditions is one of the big health advantages of living in a CCRC. A healthy diet is at the heart of healthy living, and CCRCs provide an array of food and dining choices for residents. Most CCRC contracts will include at least one meal a day, even for those who are living independently. Since poor nutrition can cause or exacerbate health conditions, having access to nutrient-rich, balanced meals (usually prepared with the oversight of a nutritionist) can help CCRC residents stay in good health. More and more communities even offer special-diet meal plans–not just low-sugar or low-salt meals, but increasingly popular food options like vegan, gluten-free, organic, and/or locally raised so this is something you need to be sure to ask about. For seniors who are considering moving to a CCRC, their motivation is frequently focused on long-term security: knowing that they will have access to a continuum of care should they need it someday. But because of the focus on keeping seniors active and well (both physically and mentally), CCRC residents may also get an added benefit: a longer, healthier life! For more information or to schedule a tour at Glen Arden, call 845-360-1400.